You may call us at 781-665-3400 or fill out the form below and one of our specialists will call you back as soon as possible. Need a tow? 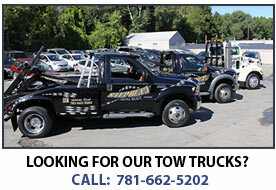 Call our towing team at: 781-662-5202. Feel free to ask a question or simply leave a comment. We request that you provide us with as much information as possible so that we can give you a precise answer(s) (details of issues, insurance company name, etc). driving directions to our shop.